The toddler stage is a very exciting time in a child’s life! They are busy acquiring new skills and trying to become independent little people. We have capacity for 10 toddlers with two energetic Registered ECE staff. The toddler room has six different areas of development to enhance the children’s skills: cognitive/fine motor, block/construction, dramatic play, creative art, science/nature and book centre. Although toddlers participate in daily planned activities, our staff encourages them to choose their own areas of interest. Our weekly lesson plans that incorporate our themes are posted two weeks in advance. Our age-appropriate developmental programs allow the toddler to feel successful every day. The toddlers play in our large playground twice a day, weather permitting. We have a variety of outdoor equipment to further enhance the active toddlers’ large motor skills. 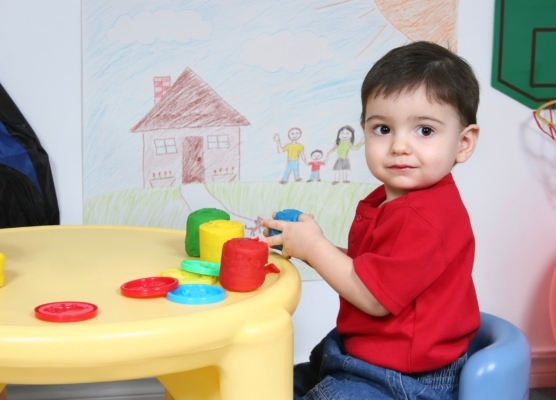 During the toddler year, the children develop language, motor and cognitive skills very quickly. It is a time to allow choice and foster independence in a nurturing environment. Toddlers become preschoolers in a blink of an eye! We are a non-profit centre with the aim to develop the whole child through an environment that fosters a positive self-image and a love for learning. Through our programs we are giving our children the confidence to explore our world. I consider myself very fortunate to have enrolled my son at the Victoria Park Day Care Centre. The staff in the infant and toddler classes have been amazing! I really like the picture updates I get during the day and the feedback I get every day when I pick my son up. I recommend any parent that is looking for a secure and loving environment for their little ones to consider this daycare. It is our second year at Victoria Park Child Care Center, and I could not be happier with the level of care my child is receiving. My son is thriving, learning new things and is enriched daily by the activities the teachers offer. The teachers are well trained and in tune with the needs of my child. He feels safe, welcome and loved in the daycare, and I have peace of mind everyday I drop him off. I am so happy I found a place like VPCC for my family! As most parents can relate, the most difficult part of being a parent is putting trust in others to take care of your children. At Victoria Park Child Care Center, I felt my children experienced a seamless transition into their care. This gave me comfort in knowing that my children felt secure, cared for and eager to learn. The structure in which this center provides gives me piece of mind knowing that the values of consistency and routines are just as equally important to them. It is not said enough of how important and at times challenging the task of these teachers are. I wish to say thank you to all who help me shape my children each and everyday. I was nervous to send my little one to day care full time when I returned to work when my daughter was 11 months old. However, I was amazed at how quickly my very particular baby adjusted and thrived in her new environment. I am so grateful that the staff helped her gain skills to become more self sufficient. Dressing and meal times are no longer a battle at home! She is so proud of all she can do on her own! The staff are very warm and inviting. My daughter is very well looked after and she enjoys coming to day care every day. My daughter has learned so much while attending the centre. They have helped her learn English, how to play co-cooperatively with other children her own age, learn her colours, numbers etc, toilet training. I am very happy with how she has grown here. As a mom of a 2 year old, I appreciate the feedback and advice I get from his teachers. They work with us as a team in helping him develop. He has learned so much while he has been attending the centre. My daughter was very shy before joining the centre and was frightened at the sight of anyone new. Through the programs offered at Victoria Park Child Care Centre, field trips and the staff’s daily interaction with my daughter (engaging her to open up and learn Nursery Rhymes), my daughter is now an avid artist and singer and doesn’t shy away from letting her opinion be known! Thank You VPCCC! My son just started Junior Kindergarten and I can truly say that his experience at Victoria Park Child Care Centre fully prepared him for this transition. The constant dedication, daily care and unlimited love that he received from the staff during his 3 years at VPCCC (from the infant room to the preschooler room) turned him into a confident boy and gave him the tools/skills to make this transition a very smooth one. Copyright Victoria Park Child Care Centre © 2016. All Rights Reserved.